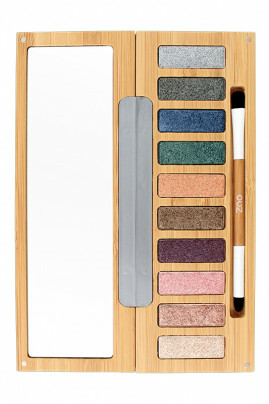 Make a festive make-up with Zao Organic n°2 Clin d'Oeil Palette in metallic and pearlescent hues! Composed of 10 beautiful eyeshadow very pigmented (silver, golden brown, champagne ...), it can make both a make-up day and evening! 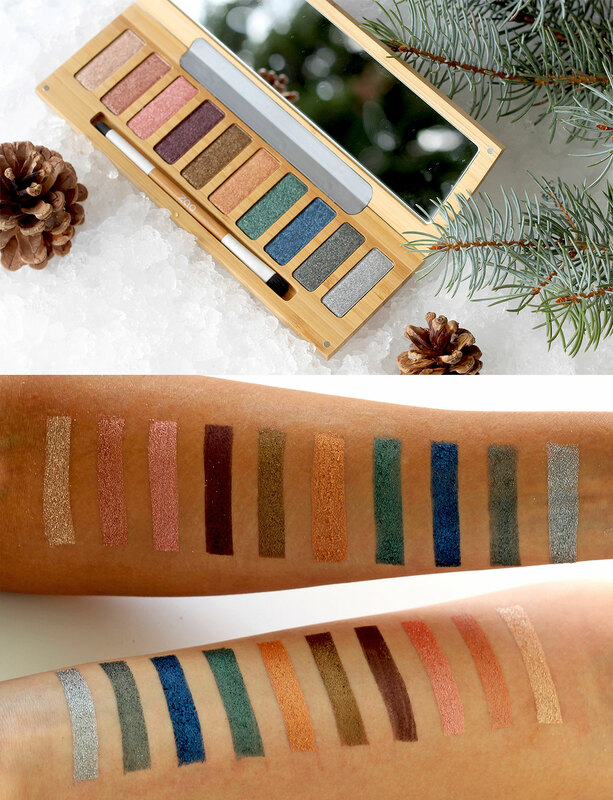 These eye shadows bring light and intensity to your eyes and highlight the natural beauty of your eyes. Rich in organic castor oil with softening properties, your eyelids are hydrated, soft and perfectly smooth. Bamboo powder fixes makeup, reduces shine and stimulates skin regeneration. Thanks to their silky texture and high coverage, these eye shadows are very easy to apply and hold perfectly all day / evening. 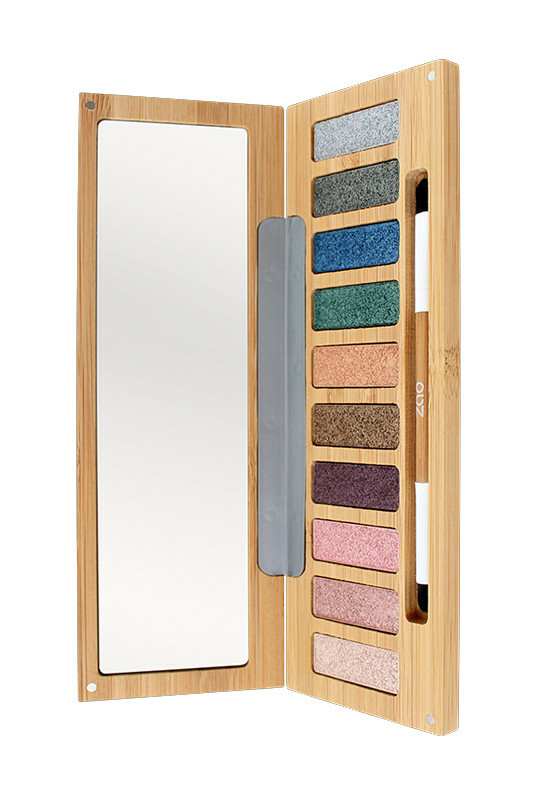 Practical and easily transportable, this rechargeable bamboo palette allows you to make a beauty at any time! 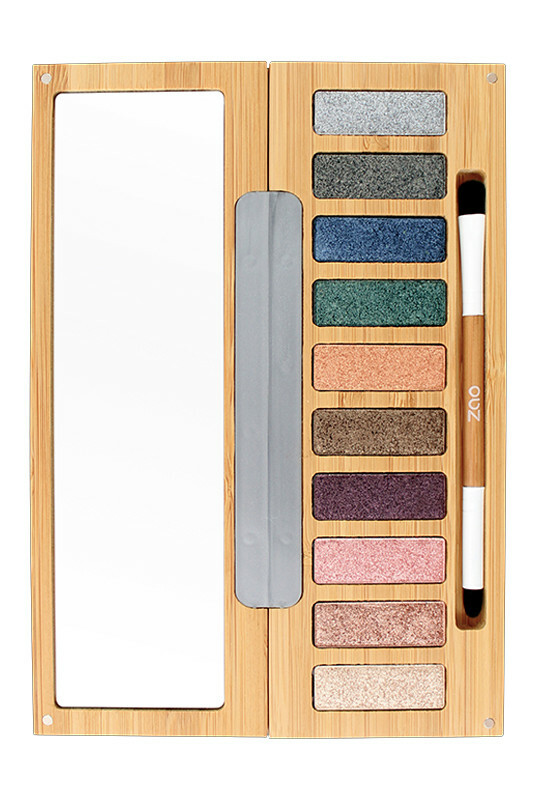 The Zao Organic n°2 Clin d'Oeil Palette is the perfect gift to please your loved ones for the Christmas holidays! Palette originale car elle ne contient que des fap pailletés Pour s’en servir je vous conseille de les appliquer au doigt et surtout d’appliquer un fap crémeux juste avant pour bien faire tenir les fap de cette palette. Si vous voulez une application plus précise le pinceau avec un embout en mousse est plus pratique pour ce genre de fap. En suivant cette technique le maquillage tient toute la journée et il est plus vibrant. On the entire eyelid, apply a light or medium blush as a base using the brush tongue tongue of the brush. For even more intensity, use a dark hue at the outer corner of the eye with the ball side of the brush. Illuminate the inner corner of the eye with a light shade. 01: This clear champagne shade is perfect for creating a soft look. Applied in internal corner, it will bring a touch of light and enlarge your eyes. 02: Sunny effect guaranteed with this pretty coppery pink! Applied in the inner corner of the eyes, even on the entire eyelid, it brings golden reflections that illuminate and refresh the look. 03: This sweet rose is ideal to give a fresh pink luster to your eyelids. 04: A gorgeous dark plum perfect on the outer corner of the eye or for an intense smoky. 05: Day and night, this beautiful bright golden brown is a must have to give depth to the eyes. 06: This golden orange is the one you need to warm the fair skin and give pep to the skins. 07: This deep green will bring out the light eyes with its intense color. 08: This night blue eye shadow will pimper your beauty. Have fun making beautiful blue smoky eyes to intensify the look. 09: This beautiful anthracite gray with a hint of green is ideal for an intense and smoky look. 10: This silver eyeshadow makes it possible to create zones of lights to illuminate the glance. Make your daily make-up with Zao! EYE SHADOW INGREDIENTS (F1) : MICA, RICINUS COMMUNIS (CASTOR) SEED OIL*, SQUALANE, LECITHIN, AQUA (WATER), GLYCERIN, SODIUM ANISATE, PARFUM (FRAGRANCE), PHYLLOSTACHIS BAMBUSOIDES RHIZOME EXTRACT*, BAMBUSA ARUNDINACEA STEM POWDER, SODIUM LEVULINATE, TOCOPHEROL, SILICA, ASCORBYL PALMITATE, CITRIC ACID, CI 77820 (SILVER). MAY CONTAIN +/-: CI 77891 (TITANIUM DIOXIDE), CI 77491 (IRON OXIDES), CI 77492 (IRON OXIDES), CI 77499 (IRON OXIDES), CI 77510 (FERRIC FERROCYANIDE), CI 77007 (ULTRAMARINES), CI 77288 (CHROMIUM OXIDE GREEN), CI 77742 (MANGANESE VIOLET). 20% OF THE TOTAL INGREDIENTS ARE FROM ORGANIC AGRICULTURE.